The Avant-Garde site in East London is a 25 storey glass tower comprising a total of 360 dwellings, including several open plan apartments, communal roof terraces and a residents' gym. There are also 17 non-residential properties, including a restaurant, cinema and office space. 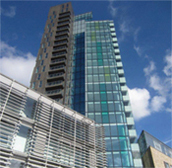 The non-conventional construction and range of materials and facades used required the team to work alongside colleagues across NHBC to mange not just the building control process but also the warranty provisions to NHBC Standards. NHBC Building Control met with the developer at the earliest stages of the development, to offer guidance on the design concepts and discuss different options to achieve compliance with the building regulations. Using our expert knowledge and extensive experience with complicated projects, we worked closely with the design team and checked all aspects of the building design, including very complex engineering issues. Working with colleagues across NHBC the design was also assessed against our Standards and feedback provided to the design team. The team also ensured that adequate test data was provided for all of the materials used on site, with NHBC assessing items such as weather tightness. Avant-Garde was recognised as one of best projects of 2015 winning a Housing Excellence Award for Best Regeneration Scheme.